While the dental extern was busy in the lab, Laura was there to help her find things, answer questions, and so forth. I was busy with other things. A couple of Navy archaeologists (yes, the US Navy has archaeologists) were in Barrow last week to look at a tract that the Navy may be transferring to UIC, the Barrow village corporation, to get an idea of what needs to be done to comply with cultural resource protection laws prior to transferring Federal land. Neither of them has any Arctic experience, and they stopped by my office to pick my brain a bit. The next day they were doing a few STPs on an old beach ridge on the tract, and asked if I’d like to join them. It was a warm sunny day, with not much wind, and therefore many mosquitos. I hiked our from my office building to meet them, we checked out the area a bit & I hiked back. Other than all the bugs, it was great. 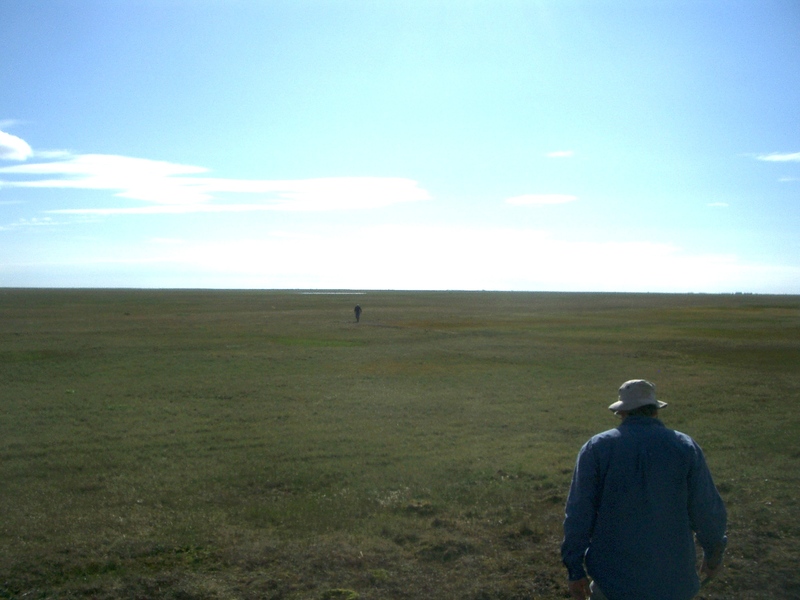 Navy archaeologists David Grant and Bruce Larson surveying. We didn’t find anything cultural that was older than NARL, but we did find a couple very old gravel beaches. We did find some stakes that had probably marked research plots, and a big aluminum object that looked like an aircraft part. It had some cable attached to the front, as if someone had been trying to tow it. Apparently they gave up. If you happen to recognize this, please let me know and I’ll pass the information on. 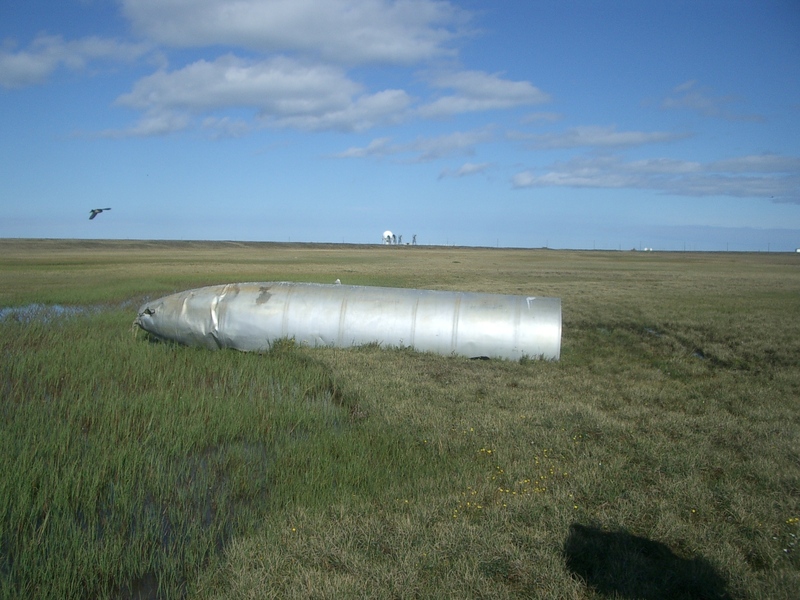 Large aluminum mystery object on Navy tract. The next day I got a call from the City of Barrow. They run the cemeteries, and had been getting reports that a coffin was partially open. They had checked, and indeed a coffin had been frost-heaved and was damaged. They asked if I could come over when they moved the person into a new coffin. We decided to do it the next afternoon, after they got the new coffin built. Fortunately, the old coffin wasn’t damaged except for a bit of the lid, so we were able to get the dirt off to make it lighter without disturbing the remains. The City crew was able to lift the entire box out and place it in the new larger coffin. It was a tight fit, because the old coffin had been covered with canvas that was nailed on, but that wasn’t clear when they had measured for the new box! Luckily they had left a bit of space, so they were able to pry a bit and get it in. I got the canvas that had frozen in out so it could go along. I’d mostly been there in case the coffin was fragile and we had to transfer the individual, to make sure that nothing got left, but that wasn’t needed. Once the coffin was out of the grave, the idea was to dig it a bit deeper, and then rebury the person. The soil profile was pretty interesting. There was clay (which generally is deposited on the bottom of bodies of still water) very close to the surface, despite the fact that the grave was on a mound. 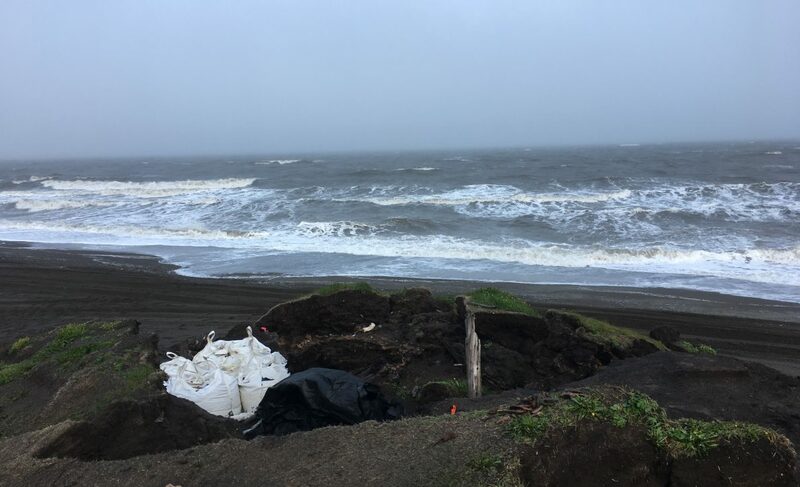 Apparently the permafrost has pushed it up a good bit, although it may have been deposited when sea level was higher than today. Permanently frozen clay exposed in grave in Barrow cemetery. 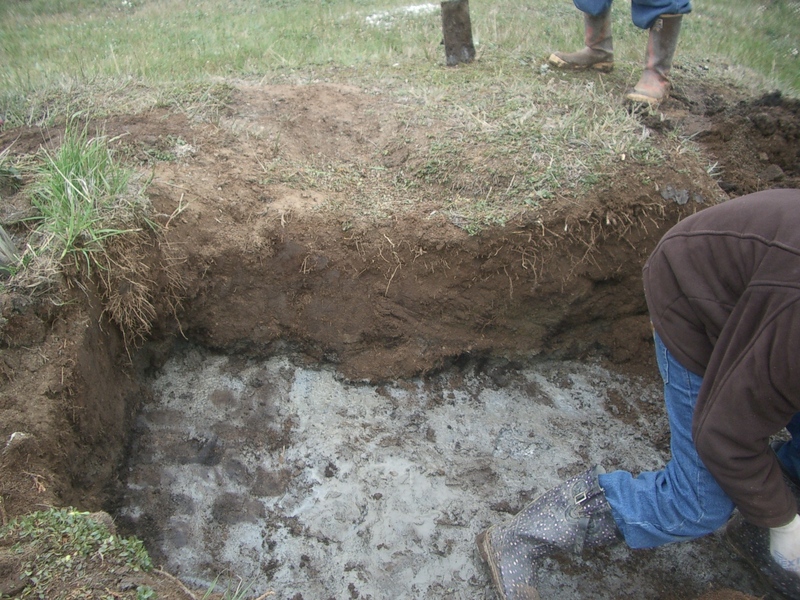 The crew did what they could with shovels, but thaw was not that deep, as you can see from the picture above, so they were going to get a compressor and jack hammer, to really get the grave deeper, when I left. If not, frost heaving would just bring the box up again in a few years. Posted on August 10, 2010 August 9, 2010 by Anne JensenPosted in Archaeology, Arctic, BarrowTagged Alaska, Arctic, Barrow, burial, crew, permafrost, public archaology, weather.